A train that has been billed as the world's longest mobile artwork will arrive in Brussels on 20 February, as part of a campaign to promote the environmental benefits of rail freight transport. After its inauguration in Katowice during the UN climate change conference, Noah’s Train travelled to Vienna and Berlin, and is now on its way to Paris and Brussels. 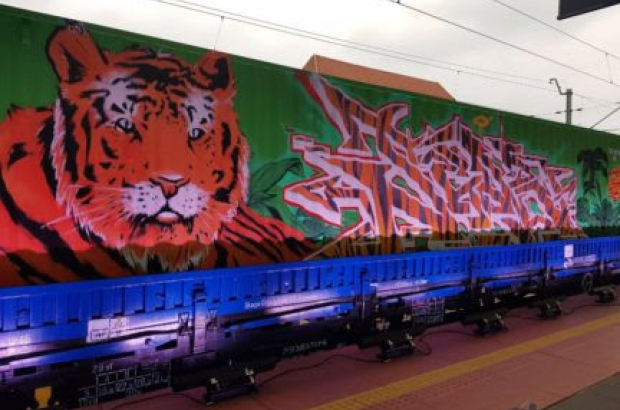 In each city, prominent street artists will paint two of the rail cars. The train is a symbol for Rail Freight Forward’s vision to make freight transport more sustainable and climate friendly. RFF is a coalition of European rail freight companies which are committed to drastically reducing the negative impact of freight transport on the environment and mobility through innovation and a more intelligent transport mix. At the Berlin stop, Alexander Doll, board Member of Deutsche Bahn, said: "Train users protect the environment, in both passenger and freight transport. Through DB Cargo's operations alone we currently save some five million tonnes of CO2 emissions annually. This is more or less the amount of CO2 that the cities of Aachen and Kassel produce together in a year." The coalition has the ambition to increase the share of rail freight from 18% to 30% by 2030. And with rail freight emitting nine times less CO2 than road freight, this shift from road to rail is a crucial step to help the transport industry reach its climate targets as defined in the Paris Agreement. The name of the train is inspired by what the organisers are calling the oldest tale of environmental activism. But the artists are not limited to the theme of Noah’s Ark. It is up to the artist to interpret and give expression to the themes of climate change, global warming, the future, life, ecology, sustainability and what we need to do to save our environment. Platform three at Schaerbeek train station, one of the very first train stations in continental Europe, will be the scene for the train's arrival on 20 February. After the event in Brussels, the rail cars will continue to travel across Europe, in the fleets of their respective rail freight companies. That way, they will continue to draw attention to the cause. Other rail freight companies are being invited to join the coalition and will each add two more painted rail cars to the fleet. By the end of the year, the containers will be reassembled again as a longer version of Noah’s Train for the next climate conference.